As any observer of the Texas Legislature knows, some of the most interesting conflicts occur in the cracks — sometimes chasms — where ideological and literal conservatism don’t line up. One such example is tied to concealed carry legislation authored by Rep. Dan Flynn, R-Canton. House Bill 47 would decrease the number of classroom hours necessary to earn a concealed handgun license from 10 to 4, while HB 48 would allow those with concealed carry licenses to renew online. 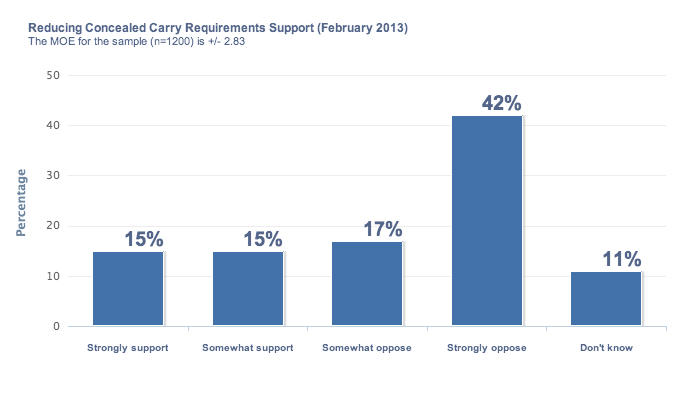 While it is no surprise to find that Texans tend to be more conservative when it comes to federal gun control measures (the one major exception is the expansion of background checks, though support in Texas lags behind national levels of support), Texans are also conservative in another, more literal sense — expressing caution toward change when it comes to proposals seeking to reduce the requirements to carry a concealed handgun. We asked respondents their opinions on many local and national gun control proposals in our February 2013 University of Texas/Texas Tribune Poll. Although their attitudes were, for the most part, ideologically conservative, one major exception came when we asked whether they supported or opposed “reducing the existing requirements for carrying a concealed handgun” — the crux of HB 47. Fifty-nine percent expressed opposition, with more than 70 percent of those expressing opposition doing so strongly. The desire to leave current law unchanged was not limited to Democrats (73 percent of whom opposed reducing the requirements); 48 percent of Republicans were in opposition, 6 points more than those in support. At least in the case of concealed carry, Texans appear to be taking a stand on the side of literal conservatism, expressing a preference for maintaining the laws currently on the books. While this type of conflict is not all that surprising when it comes to Medicaid expansion and infrastructure funding – areas where large amounts of money are at play – without looking into the data, it would have been easy to assume that Texans are uniformly ideologically conservative in their attitudes toward gun control. Taking a closer look reveals the cracks that are likely to arise over and over again as the session winds down and the Legislature moves from fights over the budget to statements of policy, often the vessels of ideological agendas. Later in the week we’ll continue with guns, taking a look at the gulf in opinion between Tea Party adherents and the rest of Texas when it comes to new federal gun regulations. This article originally appeared in The Texas Tribune at http://www.texastribune.org/2013/04/09/polling-center-texans-conservative-concealed-cary/.